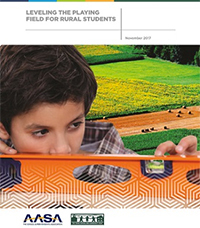 Budget Sequestration: Tougher Times Ahead for Rural Schools? High-poverty rural schools could face steep cuts if Congress and the President don’t reach agreement on how to address the nation’s budget deficit. The Race to the Top-District competition is available to districts and consortia of districts, and it is aimed at classroom level reform efforts. But its requirements raise challenges for rural districts. The Rural Trust, along with nearly 100 education, civil rights, and disability groups is urging Congress to reserve Highly Qualified status for teachers who have completed certification training. The Obama Administration is moving forward with a new "Pay As You Earn" proposal that will reduce monthly payments for more than one and a half million current college students and borrowers. The All Children are Equal Act in the U.S. House of Representatives has a new co-sponsor. The national non-profit Save the Children is the newest sponsor to join the Formula Fairness Campaign. Ever wish you had a simple tool to help you explain how the Title I formulas work and why they provide a lot less money to low-income children in some school districts than others? Now you have it. The number of organizations that are co-sponsoring a national effort to bring fairness to the federal Title I program continues to increase.